Judging from my postbag since I started these columns, smartphones have somehow morphed from a 'thing in your pocket' to 'an entire belief system' - and there are people who seem to be willing to go to any length for their chosen brand. In the last few weeks, I've bemoaned Nokia's strategy and told BlackBerry it's on a hiding to nothing. And I've noticed something. Both in the comments section and on Twitter, I've had some pretty strong messages from those who've tied their OS's flag to the telephone mast. These comments go beyond debate and into total incredulity that I've dared to criticise a mobile manufacturer. The terms "Android", "BlackBerry" and "Apple" are the new deities for some, it appears. 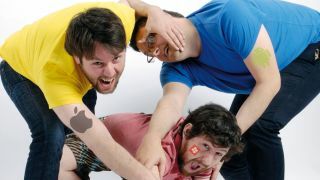 OK, so we at TechRadar are fans of tech. If you're on this site, chances are that you're really into your tech too. The thing is, like most of you, we all know what we're talking about. We're able to make informed choices about devices, and know which ones to get excited about and which ones to ignore. We love it when friends and family ask us which phone they should get. It's like playing all-powerful leader over their 24 month term. They may laugh at us behind our back and call us saddos for being able to recite spec comparisons by heart - but that bit we can tolerate, because we know they need us. In the old days, customers could opt for one of a handful of devices, choosing from Nokia (mostly), Motorola or Sony Ericsson. The likes of Samsung, Alcatel and Sendo sat on the periphery. People had preferences, but few of us tied our identity to our make of mobile beyond 'I don't really know how to use the Motorola text entry system'. But something's changed with the smartphone revolution. It's inspired a feeling that marketers are paid millions to create: brand loyalty. While Samsung may take the mickey out of the "Apple sheep", the truth is that the South Koreans wish they could generate such fervour. I was at the launch of the S4 on the morning it came out and the queue had fewer than 60 people in it. Compare that to the hundreds or thousands you'll see outside an Apple shop and it may seem paltry. But those in line had one thing in common: they were diehards. When I got out my iPad mini, I feared that an overzealous follower of the Way of the Galaxy might turn on me for soiling their collective purity. Some would say that this loyalty is a sign of love for the brand - but there's also a negative side to it, an underlying fear. When I've spoken to Apple fans who want to jump to Android but are fearful of doing it, the same line comes up over and over again. Despite being bored with a device that has barely changed in years, they always say something along the lines of: "I've spent so much money on my apps. Will I have to buy them all again?". They are trapped by their OS, prisoners of an ecosystem, in the same way that Mac and Windows users are locked out of each others' worlds. Just a couple of years ago, you had very clear markets. iPhones were for either the aesthetes or less tech-savvy types, Android devices headed to the hands of the tinkerers who liked to think they were a little more clued up, and BlackBerries went to the corporates and the kids. But now it's all change. Samsung and HTC have made Android more user friendly and desirable, and Windows has excited with its elegance. And as the lines have blurred, the talons have sharpened. Ultimately, it's a tribal mentality. And while it's fun to watch (and be insulted) by people who get wholeheartedly offended, nobody will say on their deathbed: "I really wish I'd tried an Android phone after all." There'll be no newspaper obituaries that read: "He loved Windows Phone." So, put your phone in your pocket, take a deep breath, and repeat this like a prayer: "It's only a phone."